Looking for a company who knows how to fix rust around tub drain? Get your bathtub rust hole problems resolved fast with Miraculous Makeovers. Call (423) 612-4174 for reliable, expert tub rust repair service in the Tri-Cities, TN and surrounding areas. Don’t miss out on our online specials page and save on your next service call! Is rust eating holes through your bathtub? Do you need bathtub drain rust hole repair as well? We understand that from a small rusty spot in your bathtub can lead to a bigger problem. The professionals at Miraculous Makeovers are experts in taking care of bathtub rust hole repair on the spot to avoid any issues down the road. Our excellent customer care, unbeatable warranties, and affordable pricing makes us the best bathtub rust hole repair company in Tri-Cities, TN. In most cases it is impossible to determine the cause of a rusting bathtub without professional assistance, our certified experts know how to fix rust around tub drain, repair rusted tub overflow and perform major bathtub rust hole repairs, so make sure to call as soon as possible. Do Cast Iron Tubs Rust? Cast iron tubs are heavy, reliable and will last a very long time. The only way for the cast iron to begin rusting is if the enamel has been severely damaged and the cast iron is showing through the tubs surface. The initial cost of replacing a rusted bath is costly, why go through a full bathroom remodel just because your tub is forming rust in a couple areas. How to Remove Rust from Bathtub Drain? We use a wire brush, sandpaper or steel wool to scrape the rust away from the bathtub drain. tub rust repair is completely safe if executed by professionals, it actually removes rust easier then any other solution. We utilize our heavy duty spray on rust removal then continue to scrap with a wire brush, sandpaper or steel wool. After extensive scrapping and scouring we rinse the drain with luke warm water and inspect the area. If there’s more rust remaining we will repeat the same process or take another plan of action. Receive upfront pricing: We provide upfront prices for all services before we begin any work, so you know exactly what your paying. There are never any hidden cost to worry about. Local experts: Miraculous Makeovers we have been helping businesses and homeowners in your community for over 10 years. We are knowledgeable about bathtub rust hole repair needs of Tri-Cities, TN residents and will help you carry out the best repair solutions that meet your needs. 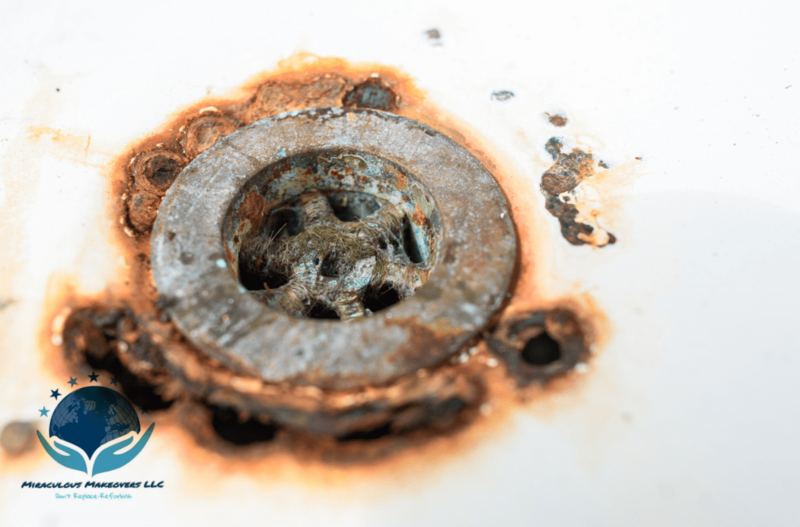 If you have rust around bathroom sink drain or need to repair rust hole in bathtub, call the experts at (423) 612-4174 and get a free estimate. Find out why we are your go-to bathtub rust hole repair contractors in Tri-Cities, TN and the surrounding areas.